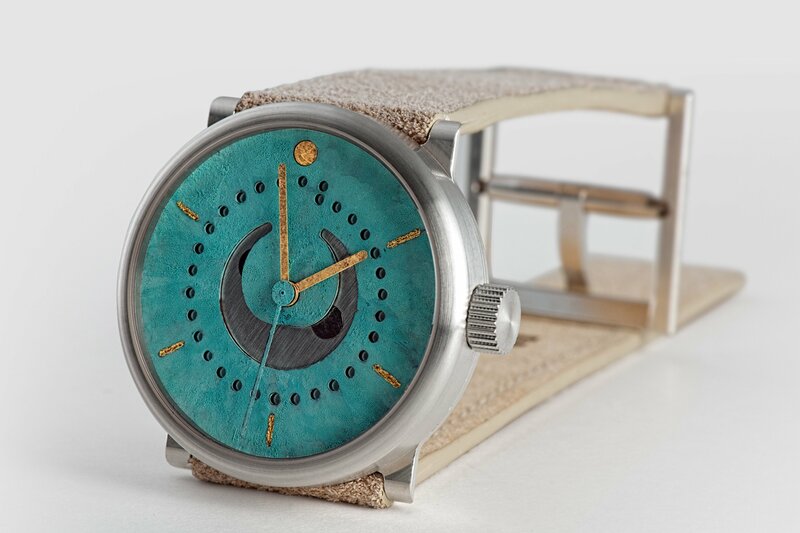 We first introduced the nebra moon phase watch in January 2013. You can read the full story behind the nebra concept in the original blog post. The new nebra pictured in this blog post features several updates to the concept. 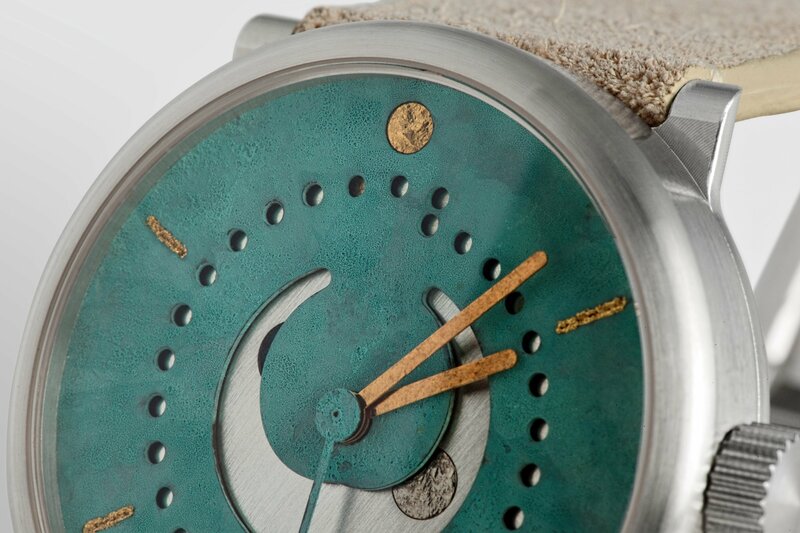 Like the original, it has a heat-treated copper-patinated dial, with inlaid 24K gold leaf markers, and a solid, hammered 24K gold sun at 12 o’clock. The hour and minute hands are now gold-plated to match the inlaid gold leaf indices. 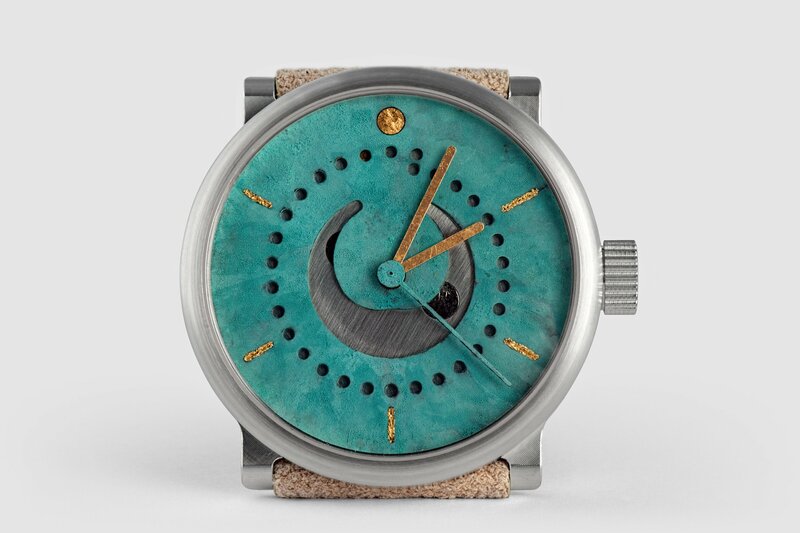 The moon disk is brushed and silver-plated, and features an inlaid solid 18K white gold full moon (4 o’clock) and patinated dark side of the moon (just visible at 10 o’clock). The date disk is also silver-plated and features a solid 24K yellow gold date dot (29th in the pictures). The strap is extremely soft to the touch and made from natural eco-tanned suede leather. The entire watch and strap – just pure materials with no added color! The nebra in these 3 new pictures is 39mm in a silver case. Nebra is available in silver or titanium in 36mm, 39mm, or 42mm sizes.